When it comes to fail-safe outfit formulas, you just can’t beat a blazer and jeans. It's a simple, chic wardrobe game changer that never lets us down. You can also wear this combination on repeat. To ensure you’re never out of styling options, today we're taking tips from the impeccably dressed style set and serving you 30 fresh outfit ideas. From neutral blazers worn with dark-wash denim for the office to classic check iterations with a logo tee for the weekend (and simple styling updates in between), here are several ways to style this timeless combination. Scroll below to see all our favourite ways to wear blazers and jeans. Style Notes: Don't shy away from lighter shades—a beige blazer looks effortlessly chic when worn with mid-wash denim. Worried about looking washed out? Add a pop of colour with a top-handle tote. Style Notes: Dress down a structured pinstripe blazer with a basket bag, logo tee and frayed denim. Style Notes: Not into neutrals? Switch out your go-to navy blazer in favour of something pink and printed. Style Notes: Modern corduroy is ideal for the weekend—just add slim-fit indigo jeans and white accessories. 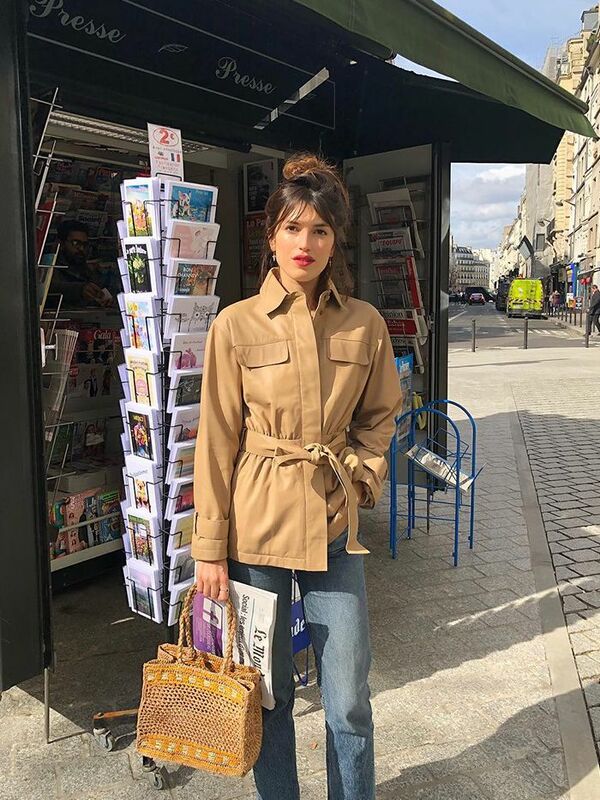 Style Notes: When choosing structured suiting, offset the roomy silhouette with high-rise jeans belted at the waist, and then team them with a fine knit and heels. Style Notes: There's absolutely nothing more reliable than an oversized blazer, a white tee and some jeans. Bonus points for adding woven mules and a basket bag. Ease into colour with muted tones. Style Notes: If you think colour is a terrifying option, then start small with a powder pink iteration and team it with ankle-grazing denim and white heels. Style Notes: How to make your classic checked blazer and relaxed jeans feel new? Add in a rope-style waist belt and red sunnies. Style Notes: Love statement separates? Go one step further and try a jumbo blazer over a black tee and cropped jeans. Top off the look with a textured tote. Style Notes: How best to make an impact with your blazer and jeans combo? Choose one key blazer (something bright, printed or structured) and keep the rest simple. Style Notes: For extra polish, try matching your heels to your blazer. Linda Tol teams a beige blazer with contrasting black buttons with The Row's monochromatic mules. Style Notes: A classic double-button blazer feels instantly cooler when paired with perspex frames. Style Notes: We're big fans of black worn with tan. We also love maximalist socks and sleek separates. Style Notes: Or why not slip a crossbody bag across your outfit? Combine classics with directional accessories. Style Notes: Your black jeans and heritage blazer will feel recharged when worn with a circular bag. Style Notes: Add a pop of colour by styling your next denim look with a bold red tee and statement earrings. Style Notes: For a more polished look, opt for a fitted blazer and dark cropped denim. Style Notes: If you work in a laid-back office, try stying your blazer look with a pair of cool white sneakers. Style Notes: Go for a mixed-print look by wearing plaid and floral together. Slip on a neck scarf. Style Notes: Accessorize in an unexpected way by using a silk scarf as a necklace situation. Invest in a pair of kitten heels. Style Notes: Kitten heels are hands down the chicest way to elevate your denim look. Style Notes: Follow Pernille's lead here and mix textures like a velvet blazer with a pretty silk top. Style Notes: Plaid-on-plaid plus high-waisted denim equals the ultimate '90s look. Style Notes: White shoes are an instant way to freshen an otherwise simple outfit. Style Notes: Never underestimate the power of a chic blazer and simple two-strap heels. Don't be scared of bold shapes. Style Notes: If you're looking for a fashion-forward look, opt for a structural blazer. Go for a graphic tee. Style Notes: Throw a logo tee under your go-to blazer and you're set. Style Notes: An oversize blazer worn with faded grey jeans is all you need if you're looking for a relaxed yet cool office vibe. Double denim can be smart. Style Notes: Do denim on denim, but throw on a blazer. Pair a colourful blazer with metallic heels for a bold yet polished office outfit.